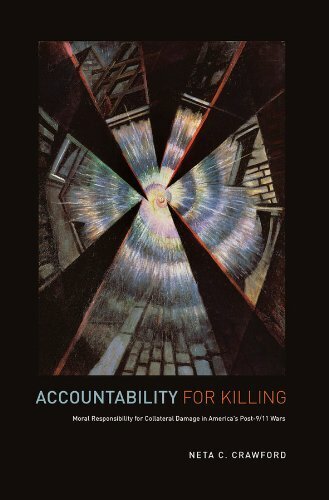 Too much of the discussion around killing in times of war focuses on accountancy not accountability; the numbers are important (and so too are the names), but Neta Crawford‘s new book, Accountability for Killing: moral responsibility for collateral damage in America’s post 9/11 wars – just published by Oxford University Press (at least in digital form) – is indispensable reading. In May 2009, American B-1B bombers dropped 2,000-pound and 500-pound bombs in the village of Garani, Afghanistan following a Taliban attack. The dead included anywhere from twenty five to over one hundred civilians. The U.S. military went into damage control mode, making numerous apologies to the Afghan government and the townspeople. Afterward, the military announced that it would modify its aerial support tactics. This episode was hardly an anomaly. As anyone who has followed the Afghanistan war knows, these types of incidents occur with depressing regularity. Indeed, as Neta Crawford shows in Accountability for Killing, they are intrinsic to the American way of warfare today. While the military has prioritized reducing civilian casualties, it has not come close to eliminating them despite significant progress in recent years, for a very simple reason: American reliance on airpower and, increasingly, drone technology, which is intended to reduce American casualties. Yet the long distance from targets, the power of the explosives, and the frequency of attacks necessarily produces civilian casualties over the course of a long war. Working from these basic facts, Crawford offers a sophisticated and intellectually powerful analysis of culpability and moral responsibility in war. The dominant paradigm of legal and moral responsibility in war today stresses both intention and individual accountability. Deliberate killing of civilians is outlawed and international law blames individual soldiers and commanders for such killing. But also under international law, civilian killing may be forgiven if it was unintended and incidental to a militarily necessary operation. Given the nature of contemporary war, though, Crawford contends that this argument is no longer satisfactory. As she demonstrates, ‘unintended’ deaths of civilians are too often dismissed as unavoidable, inevitable, and accidental. Yet essentially, the very law that protects noncombatants from deliberate killing allows unintended killing. An individual soldier may be sentenced life in prison or death for deliberately killing even a small number of civilians, but the large scale killing of dozens or even hundreds of civilians may be forgiven if it was unintentional-‘incidental’ to a military operation. She focuses on the causes of these many episodes of foreseeable collateral damage and the moral responsibility for them. Why was there so much unintended killing of civilians in the U.S. wars zones in Afghanistan, Iraq and Pakistan? Is ‘collateral damage’ simply an unavoidable consequence of all wars? Why, when the U.S. military tries so hard to limit collateral damage, does so much of it seem to occur? Trenchant, original, and ranging across security studies, international law, ethics, and international relations, Accountability for Killing will reshape our understanding of the ethics of contemporary war. Incidentally, if you are looking for historical context on the legal distinction between combatants and civilians, I recommend Helen Kinsella‘s The image before the weapon: a critical history of the distinction between combatant and civilian (Cornell University Press, 2011), and on the history of civilian casualties in America’s wars more generally, John Tirman‘s The deaths of others: the fate of civilians in America’s wars (also OUP; 2011), which starts on the American Frontier and works though the Second World War, Korea and Vietnam down to Afghanistan and Iraq. This entry was posted in casualties, late modern war, law and tagged accountability, Helen Kinsella, John Tirman, Neta Crawford by Derek Gregory. Bookmark the permalink. While I agree that civilian deaths should be eliminated, I have some concerns with this page and the book in review. First, the moral accountability for civilian deaths caused by U.S. military forces is the topic, yet the compelling picture doesn’t fit with the theme. Upon reading the small print picture caption, it is revealed that the poor child photographed was killed by suicide bombers, not U.S. military forces. Deceptive use of the photo, in my opinion, to solicit a negative emotional response from the reader prior to even reading the book. In addition, I am wondering if other countries and action groups’ (terrorists or militias) collateral damage responsibility is considered in this book…or is this simply hatred and ethical responsibility pointed solely towards the U.S. military? In my opinion, every group involved in warfare should be considering the ethics of warfare and aim to minimize collateral damage. I think the U.S. may be one of the more ethical players, considering their high focus on the creation of low collateral damage weapons and tactics.